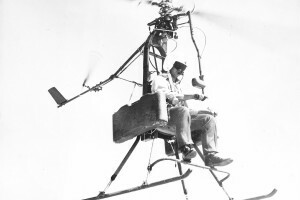 The first configuration of the Mini-Copter had no landing gear. The fuel tanks, as well as the control system for the rotor, were arranged in a sort of "harness" that was strapped directly to the pilot. It was powered exclusively by hydrogen peroxide tip jets. Also powered exclusively by hydrogen peroxide tip jets, the second version added a skeletal framework to hold fuel tanks and control systems. It also provided a seat for the pilot. The third version added a 67kW McCulloch flat-four engine. This version took off as a helicopter using its two tip jets. At 48kph forward speed, however, the tip jets shut down and the aircraft flies as an autogyro powered by the McCulloch engine. Resources related to the Mini-Copter Configuration 2, provided by the Vertical Flight Society. Resources related to the Mini-Copter Configuration 2, provided by public sources across the internet.